Disney Lucasfilm Press, 9781484705667, 400pp. 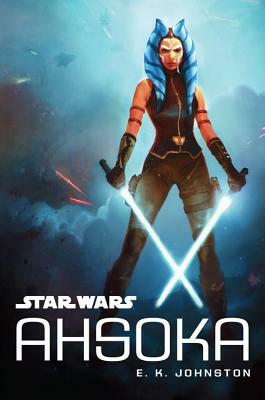 Fans have long wondered what happened to Ahsoka after she left the Jedi Order near the end of the Clone Wars, and before she re-appeared as the mysterious Rebel operative Fulcrum in Rebels. Finally, her story will begin to be told. Following her experiences with the Jedi and the devastation of Order 66, Ahsoka is unsure she can be part of a larger whole ever again. But her desire to fight the evils of the Empire and protect those who need it will lead her right to Bail Organa, and the Rebel Alliance?. E.K. Johnston had several jobs and one vocation before she became a published writer. If she's learned anything, it's that things turn out weird sometimes, and there's not a lot you can do about it. She is the author of the acclaimed novels A Thousand Nights and Exit, Pursued by a Bear as well as the forthcoming Spindle. You can follow Kate on Twitter (@ek_johnston) to learn more about Alderaanian political theory than you really need to know, or on Tumblr (ekjohnston) for pretty pictures.